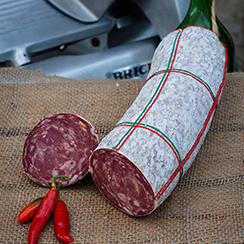 Felino is the most ancient salami recipe on record. 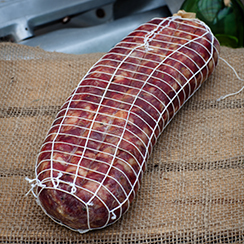 It is the sister to Prosciutto di Parma because anciently and often still today it is made from the prized trimmings of prosciutto before it is salted. 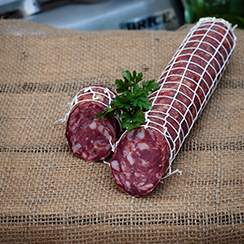 It’s a good salami for starters – meaning a good antipasto salami to start your meal and, due to its mild and accessible flavour, a good salami for those new to artisan meats. INGREDIENTS: Australian Pork (MIN 96%), Salt, Dextrose (Maize), Red Wine (contains sulphites), Starter Cultures, Spices, Antioxidant (316), Preservative (250,251), Paprika Relish + chilli. A unique blend of diced and full capers to give a sensual flavour. 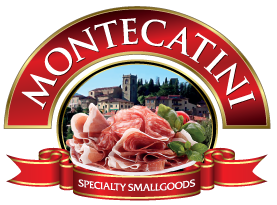 INGREDIENTS: Australian Pork (MIN 96%), Salt, Dextrose (Maize), Red Wine (contains sulphites), Starter Cultures, Spices, Antioxidant (316), Preservative (250,251), Diced capers (0.25%). 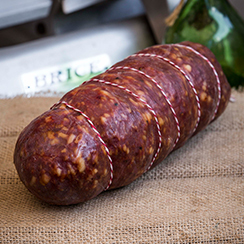 INGREDIENTS: Australian Pork (MIN 96%), Salt, Dextrose (Maize), Red Wine (contains sulphites), Starter Cultures, Spices, Antioxidant (316), Preservative (250,251), Fennel Seed (0.25%), Garlic (0.25%). Black Summer Truffles (Tuber aestivum) spring up between June and October in northern Italy. They are found by specially trained dogs who sniff out their hiding spots where they are then gathered by hand. The local mushroom enthusiasts each have a secret spot or two where they hope to find some of their own truffles every year. 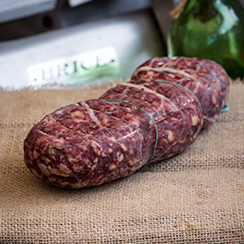 INGREDIENTS: Australian Pork (MIN 96%), Salt, Dextrose (Maize), Red Wine (contains sulphites), Starter Cultures, Spices, Antioxidant (316), Preservative (250,251), truffle oil (0.25%),Italian Black Summer truffles (0.25%). 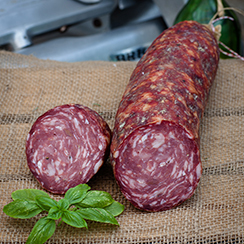 From the region of Venice, seasoned with red wine, salt pepper and other secret spices. INGREDIENTS: Australian Pork (MIN 96%), Salt, Dextrose (Maize), Red Wine (contains sulphites), Starter Cultures, Spices, Antioxidant (316), Preservative (250,251). 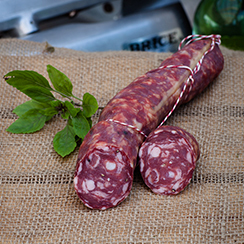 Cased in a beautiful white cloth with true Veneto flavours. INGREDIENTS: Australian Pork (MIN 96%), Salt, Dextrose (Maize), Red Wine (contains sulphites), Starter Cultures, Spices, Antioxidant (316), Preservative (250,251) + chilli. Made slightly smaller all the flavours combined give a burst when sliced with fresh bread and your favourite accompaniment. INGREDIENTS: Australian Pork (MIN 96%), Salt, Dextrose (Maize), Red Wine (contains sulphites), Garlic, Starter Cultures, Spices, Antioxidant (316), Preservative (250,251) + chilli. 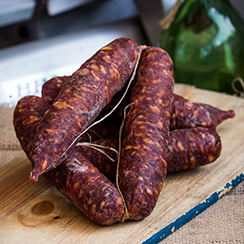 The kidney bean shape of the Sopressa Salami comes from a special natural beef casing traditionally used for Sopressa and Finocchiona salamis. INGREDIENTS: Australian Pork (MIN 96%), Salt, Dextrose (Maize), Red Wine (contains sulphites), Starter Cultures, Spices, Mineral Salts (341), Antioxidant (316), Preservative (250,251), Truffle oil, Truffle essence. 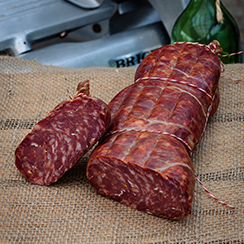 A pressed salami which gives a distinct flat look, beautiful when sliced. 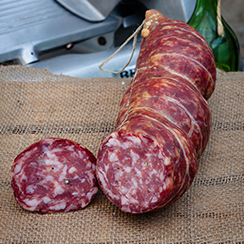 A traditional Sopressa that has been prepared with the addition of olives. 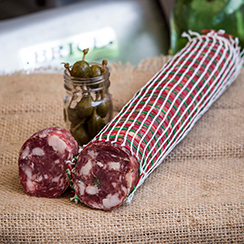 INGREDIENTS: Australian Pork (MIN 96%), Salt, Dextrose (Maize), Red Wine (contains sulphites), Starter Cultures, Spices, Antioxidant (316), Preservative (250,251), Green pitted olives. 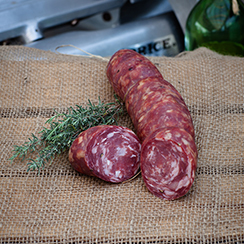 A larger rustic styled salami with a slightly deeper capsicum flavour.